Who knew that correctly timing push notifications to mobile app users can help developers increase app retention rates? That's one of the key findings in a new report from Leanplum Inc., which applied data science techniques to mine information from millions of mobile interactions in order to discover strategies to address the always-problematic issue of mobile app retention. The integrated mobile marketing specialist condensed its findings in a new report titled Retention, Revealed: The Need-to-Know Facts Behind App Retention & ROI (free download upon providing registration info). So just how problematic is the issue of mobile app retention? 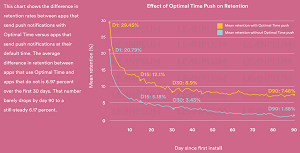 Leanplum said it discovered that by day one of an app install, apps have a 21 percent retention rate, and by day 90, the retention rate shrinks to 1.89 percent. It also discovered the timing of push notifications to users is key in bucking up that retention rate. Specifically, a machine learning algorithm called Optimal Time is valuable because it analyzes individual engagement patterns to automatically send messages when users are most likely to open them. The resulting increase in app retention rates can pay off big. 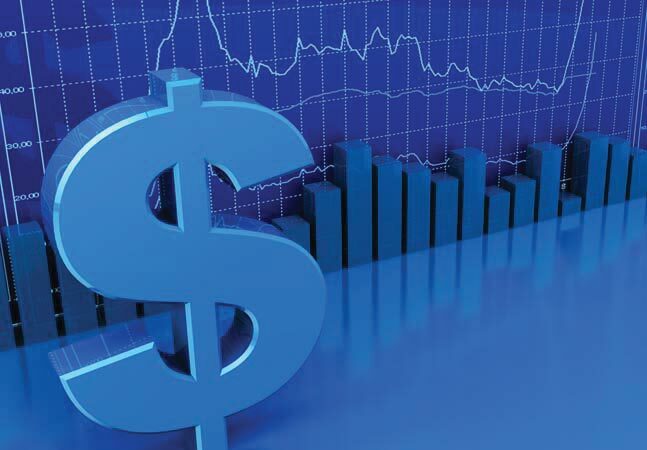 For example, Leanplum said, an episode of the Silicon Valley TV show features a scenario in which a company's app enjoyed 500,000 installations but left some $962,000 on the table because daily active users (DAU) numbered only 19,000. Timely push notifications might have helped. "The data from our latest analysis highlights that Optimal Time for push notifications is one of the most effective and measurable user retention strategies," said company CEO and co-founder Momchil Kyurkchiev. "We are seeing continued validation that push notifications offer a valuable engagement channel. And with iOS 10, Apple is upping the ante on interactive notifications with richer content like photos, audio, videos, gifs and custom layouts. Ensuring push notifications are personalized and optimized through A/B testing will help mobile teams reach a higher percentage of their customers and capture more revenue." The company noted that Apple's enhancement of its iOS push notification functionality comes after previous research that indicated twice as many Android users opened push notifications as iOS users. 68 percent of users are simply dormant in the first week, which means developers have opportunities to win them back. If an organization can improve the day 10 numbers, it can positively impact the retention of a user throughout the first month. Sending a push notification can improve retention by 20 percent. 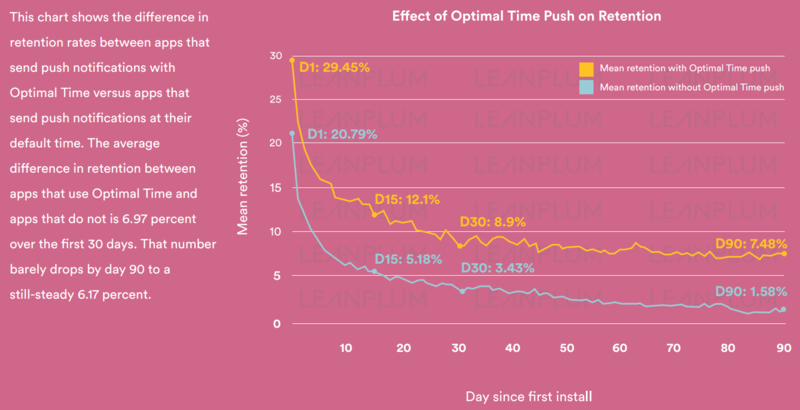 Apps that send push notifications with Optimal Time see retention rates 7x higher. This kind of personalized push results in millions more potential revenue -- for one app, an extra $229 million. Use push pre-permissions -- Maximize your push notification opt-ins by using a pre-permissions message that suppresses the default iOS prompt and instead explains the benefits of push at a time when the user is more engaged. Use Optimal Time -- Use a machine learning algorithm like Optimal Time to personalize message delivery to individual engagement platforms. A/B test mobile strategies -- Continually experiment with messaging strategies via A/B testing. Optimize the frequency with which you send messages, test the segments who receive messages, discover which channels garner the most engagement and more. Note that Leanplum provides mobile marketing services featuring messaging, personalization, A/B testing and more. The report is based on an analysis of more than 200 apps, each with at least 100 first-time users. Data was collected from users who first opened the app between March 1 and March 7, 2016.